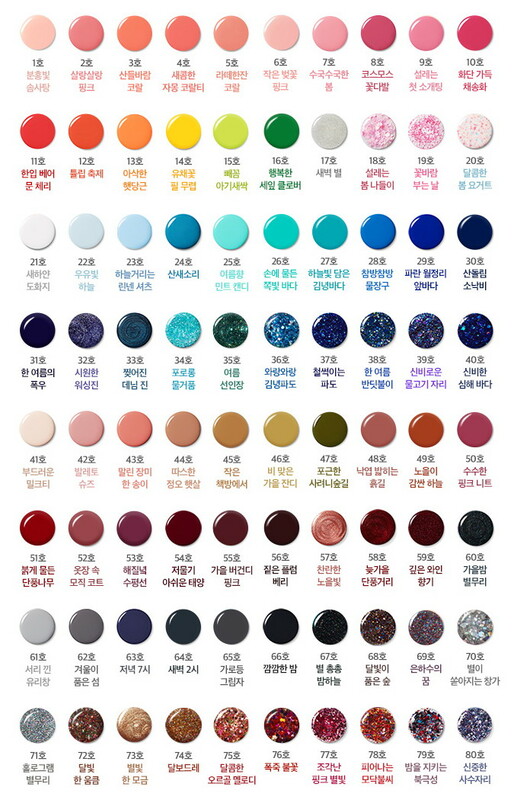 Innisfree Real Color Nail, Color Chart. As you can see, the color swatch isn’t too far off, and it’s a really pretty, shimmery denim blue with silver shimmer. Except in sunlight: this is holographic! Score! The formula is a little sheerer than I’d have liked, and the pigmentation isn’t strong. This is either kind of annoying, or a plus if you’d like to use 32 as holo layer over another polish. It applies quite evenly so it would definitely make a good topper. Two coats gives almost full opacity, which isn’t too bad. It also dries to a very nice, hard and glossy finish. The holo itself is very fine and pretty, and I should really try to photograph it again later, because my camera was just not picking it up well at all! The brush is a wider, flat brush with a squared off edge; I prefer a narrower brush or a wide paddle shape, but this brush works all right for me. I think overall I’d still recommend one of Color Club’s phenomenally blingy Halo Hues holographic shades, or a lovely subtle holo from A England, before I’d recommend this Innisfree polish. Unless, of course, you like the semi-sheerness of 32! I prefer full opacity and high pigmentation, myself. But for the price, this holo is tough to beat. Innisfree Real Color Nail retails for US$4.59 (at Cosmetic Love [referral link], where I purchased it) and contains 6 mL. It is made in South Korea. The company is cruelty-free at home, but they do sell their products in China, which currently requires foreign cosmetic products to be tested on animals. Innisfree is an all-natural cosmetic brand launched in 2000 by Korean cosmetic giant AmorePacific, who also own brands like Etude and Laneige. The company name, Innisfree, is derived from a William Butler Yeats’ poem. Innisfree is based in Seoul, South Korea. Thanks! You should, they’re especially nice for the price! Neat colour! Especially in the sunlight. I just took a picture of my laptop screen with the Google Translate app and it says “Cool Washin'” as the translation! 😛 Interestingly enough, #31 translates to “Midsummer Heavy Rain” and #33 is called “Torn Denim Jeans” XD The colour #57 caught my eye and it translates to “Gleaming Light”. I got the app for our trip to Japan and it’s so fun to take photos of stuff and translate!